This is not a vacation home that we built as much as it is an experience that we created. Please read our guest reviews! As seen in Sunset and Dwell Magazines, the Lotus Lake House is a completely 'green' exclusive home designed by the award-winning architect Michelle Kaufmann. Its sleek & modern with accordian-style glass walls that completely open to the deck and views of the lake. Lots of windows and cool welcoming tones. We are completely off-grid and have been awarded 'Build it Green' and 'Keep the Sierra Green' certification. We're situated on 7 acres of private forested property. We cleared just enough trees to have fabulous views of Rollins Lake or instead of just gazing, hike the private trail from the deck to the lake and hop in the canoe we provide guests. With the glass 'Nano' walls open to the outdoors - indoor and outdoor living is blended. No neighbors or other structures in sight! Just the Sierra Mountains, trees, deep blue water, deer, owls, raptors and the ocassional honking geese. Whether you are on the deck sipping coffee and watching the beautiful sunrise over the mountains, reading, sipping a drink at sunset or star gazing at night, the experience is magical. Our home is ideally suited for a romantic get-away, or for a couple of good friends or close family members who just need a retreat from the stresses of daily life. Sit on the deck and enjoy the water activity during the summer, swim in the lake or come off season when it's absolutely still. Ideal for writer/artist retreat. Only earth-friendly products are used so it's perfect for people with chemical sensitivities. For those who want to support the environment while staying in an exclusive and unique property, you can't ask for more. You'll feel like you are in a treehouse. As one of our guests said, 'if you need to relearn how to breathe, this place will teach you'! Come experience off-the-grid living in luxury! The Lotus Lake House was the showcase home at the 2007 West Coast Green Show in San Francisco. Please read our guest comments as they describe the experience better than we ever could!! We are very interested in doing our part to protect our planet and the environment. Both refugees from the corporate world in Silicon Valley where we held demanding jobs we enjoyed building our dream eco-friendly vacation home in the middle of a forest overlooking beautiful Rollins Lake. Tod designed the off-grid system himself and despite his wife's initial trepidation, it's amazing! This is our home and when it's not rented we delight in escaping the Bay Area for the beauty and simplicity of its zen-like qualities. We love the Sierras and a number of years ago bought 8 acres in the forest overlooking Rollins Lake with the intent of building a low carbon-footprint vacation home that would be all about the views. Although our home is private & secluded we liked that we are within 10 minutes of wineries, the quaint artist town of Nevada City, the historic Gold Rush town of Grass Valley, hiking, exploring the gold mines, and organic farms and only 45 minutes to Sugar Bowl Ski resort. You will come away rejuvenated, even after just 2 days! As one of our guests wrote: 'If you need to learn how to breathe again, this place will teach you'. Most of our guests have plans to do lots of things and wind up not leaving the house! The seclusion, the tree-house feel, the lake views and access to the lake and a canoe make this a very special getaway for 2. We have gorgeous lake views from 3 sides and we are on the lake. Private hiking trail down to the lake; canoe available for guest use. You are in the forest surrounded by trees; across the lake is nothing but the Sierra Mountains. 600+ count linens made from natural and organic fibers. Allergen-free. free wifi in Colfax, 5 min away. You don't even have to get out of your car. no way! We want you enjoying nature not watching the discouraging news. Pop in a DVD instead! The entire deck is surrounded by cable railing for protection but so as not to obstruct the view. Not suitable for small children. deck wraps around the house and total living space is over 2000 sq feet. Several dining areas on deck plus rockers and loungers. Glass walls of house open up to deck making it one big indoor/outdoor space. Fenced in area for dogs in addition to woods. Private trail to lake. Gas patio heater. Stunning place, loved visiting. We were here in late November with cooler temps and some rain and it was a great woodsy retreat, although our deck time was limited. I can only imagine how wonderful it would be in the summer with access to the lake. Ignore all the comments about the heat/warmth, the radiant heat does take some time but warms right up. Thanks! An exceptional property above the lake in a most peaceful setting. This is our second stay at the Lotus Lake House and it was absolutely wonderful. It has everything that we could ask for. My small family enjoys the outdoors and the beautiful location surrounded by pines with views of the lake below you is just perfect. We would go on runs each day on the quiet roads and we spent a day on the lake wake boarding in a rental boat. It was so much fun. This place is even better now with the option of renting the tiny house with the main house. This way we could spread out a bit but be right to each other with no one else around. We especially love that we have a small environmental footprint when staying at the Lotus Lake House. This matters a lot to us. We will definitely be back. Thank you for a fabulous vacation. Super open and airy. The outdoors and indoors flow together. We felt like we were in a tree house high up in the forest. We absolutely loved the house! We felt luke-warm about the lake, but we’re total water people so we had hoped to do lots of swimming, fishing, and canoeing. The noise from the power boats was mostly okay because the home is high up on a hill. We loved the walking path down to the lake. House has an awesome and huge deck where we spent most of our time. Lovely views! We lost power a few times, but after the first time the handy man came righhnover to show us how to turn it back on. We’ve stayed in many rental homes, and this is one of our favorites as far as the actual home goes. We have two teenagers and they both loved it too, and the four of us fit easily in the home. Visit Happy Apple Kitchen and farm stand for tasty produce (summer), pies, and an old-fashioned feel. Grass Valley is a great, small town 20-minutes away. Chicago Park store near the home is small, yet has a good selection of groceries, and fishing bait, in case you forget something. We highly recommend this home to couples or families looking for a relaxing and unique place to stay. The owners pay close attention to detail and the space is beautiful! The information on the website does not adequately inform the renter about what's involved with operating this house. It is not until you arrive, and get access to the "house book", that the most important information needed to make an informed decision about renting this property is made available to you. 1. access to the internet-a 20 minute drive from the house to Safeway/Starbucks. We emailed the owner about this and his response was that a poll had been taken and it was decided that there would be no internet. We did not know about this poll. It was not listed on the web page. We also had no TV/Satelitte. 2. heating the house and having hot water-a few small solar panels plus a generator were supposed to provide heat/hot water...both woefully inadequate to provide either one. The backup plan in the "house book" was to use layers of clothing and lots of blankets. At midnight, no heat...at 7 am, no heat..., at noon when we left the property...no heat. An informed decision about renting this house cannot be made without the information included in the "house book". We are always upset when a traveler has a less than 5 star experience but we don’t know what to do when a rare traveler doesn’t call for support from our three-person local team and then feels that leaving false information in a negative review helps the community. 1. The Lotus Lake House is a 5 star romantic getaway. Cell phones and hotspots work great here, so urgent matters can be handled with your phone. Colfax is a small city with all services and is precisely five miles drive on Hwy 174, Grass Valley/Nevada city are larger and 9.6 miles away. If you need Internet access for romance hotels provide that. There is a 65 inch TV in the living room and extensive DVD collection, no cable TV is provided. 2. The house is heated with propane and hot water provided by a high-end Bosch instant hot water heater just like most homes. No one has asked for any changes to the heating or hot water system, so we can’t imagine what they wanted in addition to standard home systems. Neither the hot water or heat are provided by solar panels. The lake house is supported by a three-person team, all are local and two less than 5 minutes away and the property has more than 90 five star reviews. All staff know the basic systems and each specializes in some area of the property. The team was not called even though the phone numbers are provided in the directions, the manual and even posted on the wall in the pantry. We are in the Sierras/California Gold Country. 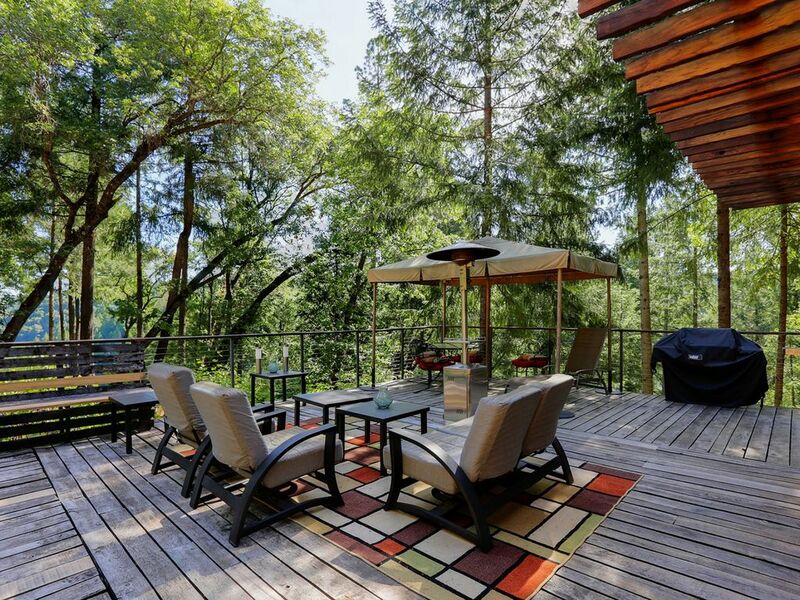 While totally secluded and nestled in the forest you are minutes to the historic gold rush towns of Grass Valley and Nevada City as well as other beautiful little towns. There are wineries, gold mine tours, theatre, shopping, restaurants, hiking, swimming and water sports, There are wonderful festivals such as Cornish and Victorian Christmas, The Wild & Scenic Film Festival, lots of art galleries.